Under the hood is a shiny 289ci V8 engine topped off with a 2-barrel carburetor. Johnny Walker's Burgundy 1967 Mustang hardtop is our Attitude Of The Month for October 2009 and is featured in our 2009 calendar. 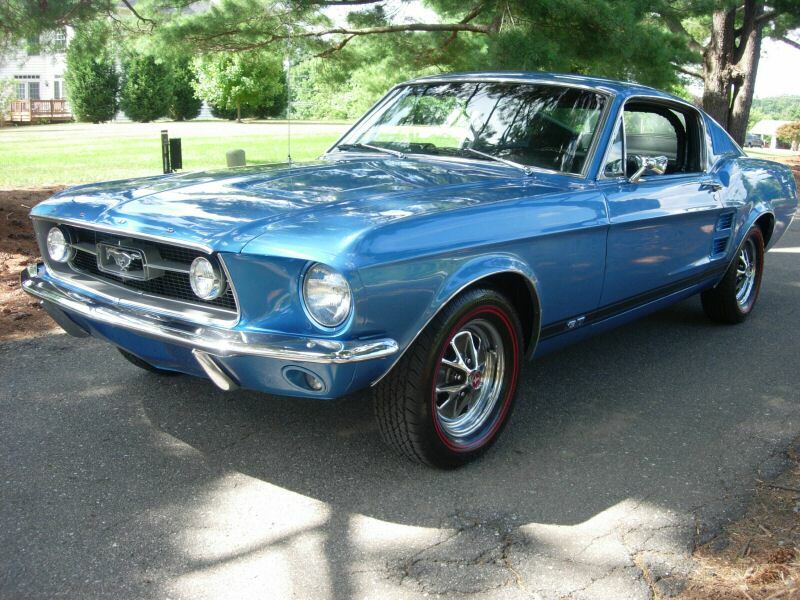 Acapulco Blue 1967 Mustang which came originally with a 200hp (at 4400rpm), 289 cubic inch, V8 engine. This Mustang was made into a GT but has its original paint and interior seats. A 800 x 600 pixel desktop wallpaper is available for this car. 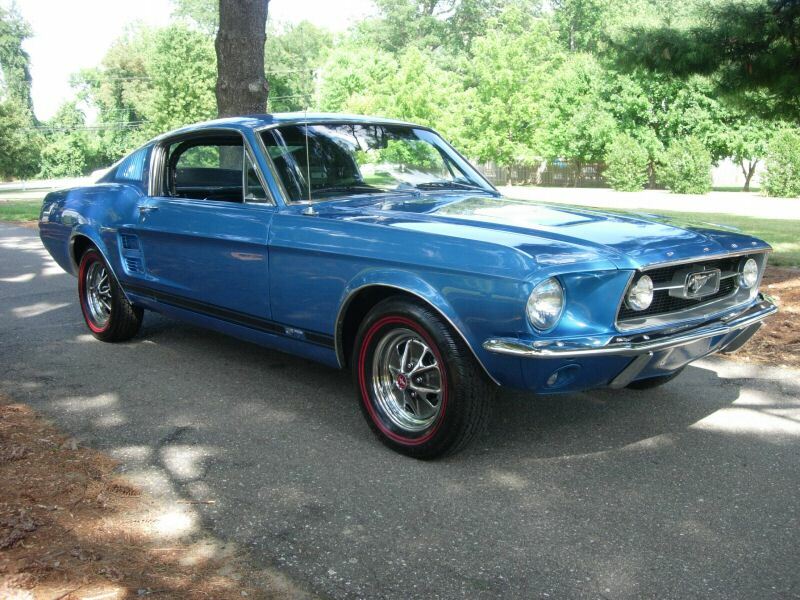 Right front view of the Acapulco Blue 1967 Mustang. A 800 x 600 pixel desktop wallpaper is available for this view. Interior view of the 1967 Mustang with the optional center console which was originally $50 and required one of the radio option (AM radio for $58, or AM/FM radio for #134, or stereo-sonic tape system add-on for $128). This is because the center console wraps up and extends into the dash where the radio is. Front view of an Aspen Red 1967 Mustang Ski Country Special photos with new black stripes and wheels. The VIN number indicates that this car came with the C-code, 200hp (at 4400rpm), 2 barrel, V8 engine. The door data tag reads: 65B hardtop body style, blank color code (but in this case for Aspen Red, Ford MX 707587 (DuPont 2721H 93-83001H)), 6A black decor interior with bucket seats, 26L assembled on the 26th of November 1966, 51 ordered in the Denver area, 0005 special order, A 3.00:1 equa-lock rear axle ratio, W automatic transmission. Further information shows this to be Order Type local promotion, DSO Item # 2238, Dealer # 76A011, Fordland, 11000 W Colfax Ave, Lakewood, CO 80215. We think this car is still in Aspen Red; a color first used on the 1958 Ford Edsel and later used on custom Gibson guitars. Aspen Red 1967 Ski Country Special Mustang hardtop, right side view. The 1967 Mustang Ski Country Special hardtop which featured ski racks, snow tires, equalock rear axle, coffee bar and a Ski Country Special hood medallion. The Ski Country Special was a winter promotion in Colorado which complemented the summer High Country Special. Original options on this car included a black vinyl roof, automatic transmission, limited slip differential (for driving in the snow and ice), 14 x 7.35 inch 4-Ply rated tires (snow tires), white Rayon sidewall tires, wheel covers, rear trunk-top luggage rack (ski rack), power steering, 8 track AM radio, Exterior Decor Group, Interior Decor Group, tinted glass, and a heavy duty battery. Original color selections included Aspen Red, Vail Blue, Winter Park Turquoise, Loveland Green, or Breckenridge Yellow. This car was originally Aspen Red. Frank adds, According to the Marti Report my car was painted orange, I have not found a color chip on the Aspen Red so it's hard to say that this orange is Aspen Red. The Marti Report states special paint and I got in-touch with the owner and they said this was the color they ordered the Ski Country Special in. So we at MustangAttitude will call it Aspen Red until we are proven wrong. Left rear view of a 1967 Aspen Red Ski Country Special Mustang hardtop. You can just make out the Ski Country Special rear deck emblem that Frank re-installed. The deck lid here is missing its luggage rack which was part of the original Ski Country Special. The luggage rack was advertised as a ski rack; but in reality, it may have been too small. Some people, called this rack a coffee bar since it had a trailing edge bar which raised up about 2 inches; just enough to keep your coffee cup from falling off the deck lid as you adjusted your bindings. Here is a close-up of the Ford Ski Country Special metal rear deck emblem. The recessed part of this emblem has been painted black. The Mustang Ski Country Special was available for the hardtop or fastback. In 1967, the Ski Country Special options package could be also ordered on the Ford Galaxie or Fairlane. Well, after searching http://www.performancecoatings.dupont.com for Aspen Red, Ford MX 707587 (DuPont 2721H 93-83001H)), MustangAttitude found the color in the 1958 Edsel Color Bulletin No. 1. Now they (probably Edsel) calls it Ember Red, but its the same numbers and the color chip looks like this car as well as Edsels found on the net in Ember Red. So mystery solved, we now know what Aspen Red looks like. Frank, you indeed have a rare car. MORE INFO: we did some research on Edsel Ember Red and found some nice sites out there talking about Ember Red from the 1958 Edsel being a custom color for vintage Gibson guitars. Frank's Aspen Red 1967 Mustang Ski Country Special at a car show. Here is a shot of it's original C-code 289ci 2V V8 engine. The interior is black. It has metal inserts on the door panel. Dark Moss Green 1967 Mustang with a 200 hp (at 4400rpm), 289 cubic inch, 2 barrel, V8 engine. This car has the optional wire wheel covers which were originally and additional $80. Front end view of a 1967 Dark Moss Green Mustang. 1968 Dark Moss Green Mustang, left front view. Left side view of a 1968 Mustang in Dark Moss Green paint. Dark Moss Green 1967 Mustang showing its 1967 reverse indented taillights and rear center gas fill cap. 1967 Ford Mustangs Thumbnail Collection. Page 2 of 39.